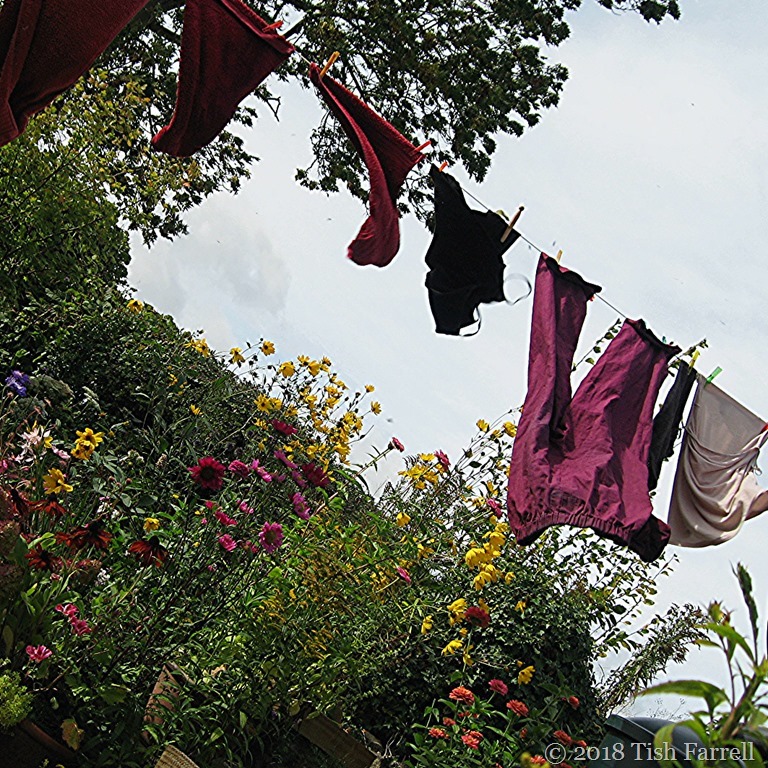 Posted on September 19, 2018 by Tish Farrell	This entry was posted in Environment and tagged #InthePink, #StormAli, gardens, Tish Farrell Writer, Weather, WPrightnow. Bookmark the permalink. Oh what a hoot! You have made me chortle. I’ll have you know those are my best summer gardening bloomers – famous in field and allotment. Stunning colour co-ordination between garden flowers and “bloomers”, wonderful! Bloomin’ heck! My girls are not wearing any bloomers today. The gorgeous flowers show that summer is not over yet in your corner of planet earth, Tish. Our storm over here certainly left things in a mess for people on the East coast. Prayers for your people. Likewise here . . . . . proving to be an un-English an autumn as it was a summer, weatherwise! Now we have swiftly alternating sun and rain too. Not much rain here yet, but the sun does keep losing and then putting his/her hat on again! I’ve just had to dash out and bring the washing in! Almost dry. Can’t keep up with you and Jo dashing about. She was off to meet a few warriors though rather than washing! Jo and the warriors – intriguing. If there was a way to share with you our bipolar weather, I would. Thank you, Mak. Big hug! I hope your storm is less severe than Florence has been in our Southeast. Stay safe! Many thanks for those good wishes. It’s all a bit bonkers! I so agree about the waste of sunshine and breezes. Saves adding all those chemical smells to the wash too. To say nothing of the waste of electricity — there’s so much sunshine, it is a shame to waste it! We have had the same weather here on the west coast of Norway. Storm and high temperatures (for the season). You laundry certainly would have gotten plenty of air. Hope the storm will not be too wild – it is coming our way tomorrow and Saturday. Lovely laundry shot with the colours of the flowers reflected. Thank you for the good wishes, Ann-Christine. In the end the wind fizzled out without the promised fiercer storm. Now we have lots of rain instead – a bit of surprise. Sounds as though you escaped the worst of Ali. Do you ever lay your washing on the grass or on lavender bushes ( on a non-windy day of course!)? That’s a lovely way to get fresh scent into linen and clothes. Laying laundry over lavender sounds delightful, but my garden is really geared up for horizontal drying. I shall think about it though. Sadly I don’t have a decent drying line at all. The man, or men, who designed this house thought a little place on the coldest side of the house would be adequate! Hmph. Men designing domestic items – generally not good.